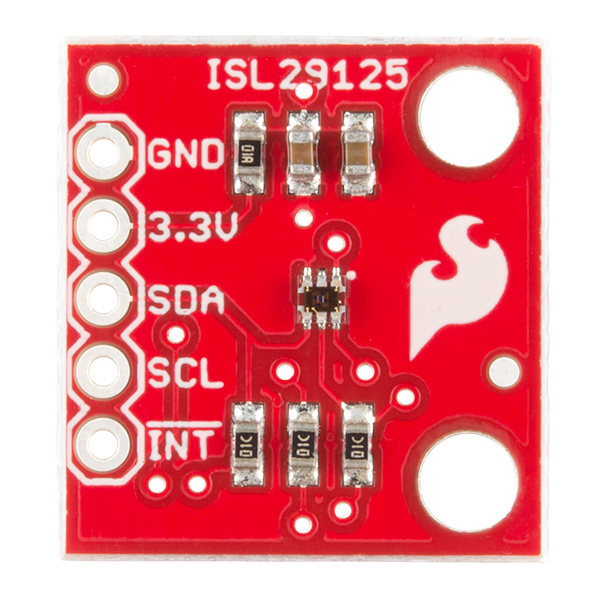 If you’ve had ideas for a project that depends on the ability to sense different spectrums of visible light and react based on those measurements, the ISL29125 breakout board may be just what you need. 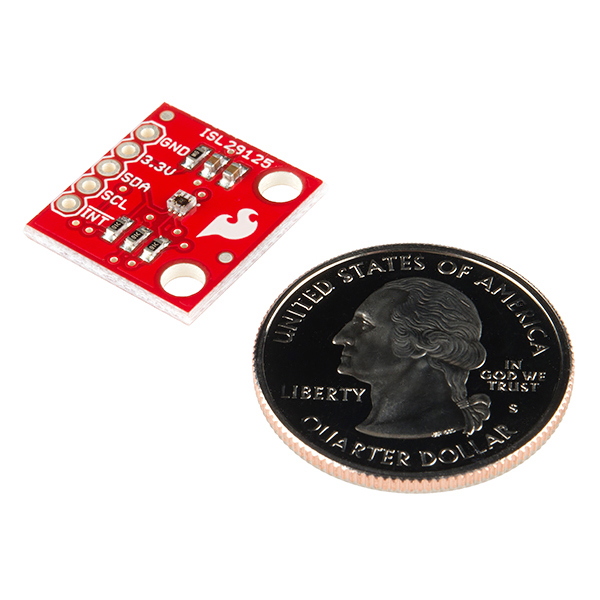 The ISL29125 breakout board makes it very easy to sense and record the light intensity of the general red, green, and blue spectrums of visible light while rejecting IR from light sources. 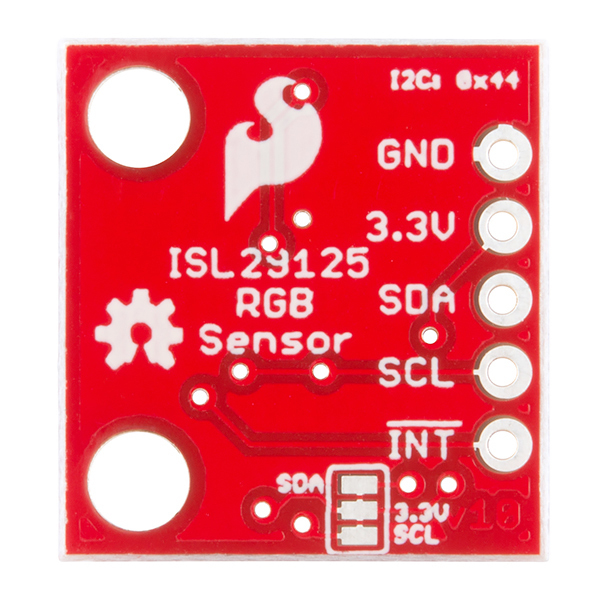 You can then use these color sensor readings for the purposes of logging and finding patterns, or creatively calculate and make control decisions in your electronic projects. I've managed to get the Arduino to read values from the sensor, but it only returns FFFF. Is it possible I've damaged something on the board, or do I just not have the libraries installed properly? I'm having the same issue. did you ever figure it out? Hi! Is there a way to change the I2C address? I'd like to use 6+ color sensors in my project. Hi I cannot read any RGB vals even though i connected everything as in the Hookup guide. I think the problem is in the â.init()â function because it never prints : "Sensor Initialization Successful\n\r" What can I do? First off make sure you have installed the libraries for Arduino correctly. If you have you should start by taking a scope and looking at the SDA and SCL lines. SCL should just be a clock, but by looking at the SDA line you can see the starts, bytes, ACKs and stops. That can at least give you an idea if the sensor is responding to the master. If you aren't getting any response, make sure you have SDA and SCL correct. If you never see the SDA line get a response, it could be the sensor. I am struggling to use this device to read blocks(red, blue, green, and yellow). I have tried various combinations of settings with little success. When reading any color I get semi-unique readings(but not unique enough to differentiate from some of the other colors). The thing is even when reading a base color block I still get high values of the other bases. (I.E A red block reading R:33076, G: 44118, B:28877). Does anyone have any suggestions on how to make this more usable? 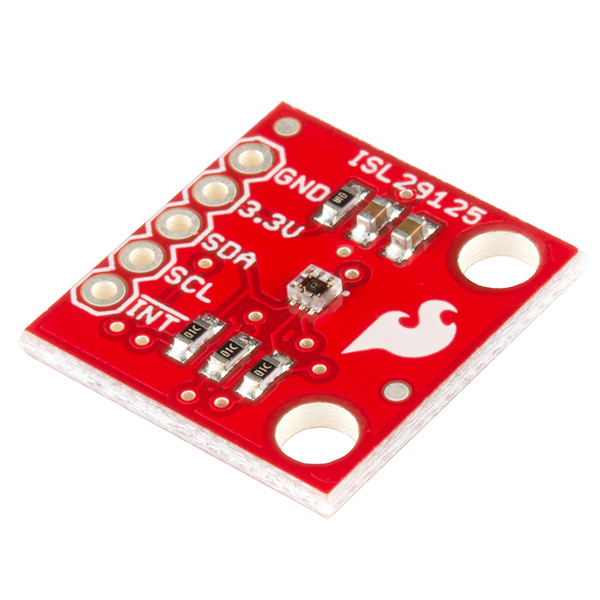 I'm looking for guidance in building an enclosure for this and the ML8511 uV sensor ( https://www.sparkfun.com/products/12705) and the TSL2561 Luminosity sensor (https://www.sparkfun.com/products/12055) combined. My students are building a a light metering device for the school greenhouse and they are trying to determine what transparent material to use. They have decided to test glass, acrylic and polycarb and I am trying to get a sense of what they will find out before thaey test. (it allways pays to stay ahead of your students if you can!) Can anyone tell me how these materials might attenuate the incident light? Does anyone have any suggestions for other suitable "window" materials? Any help would be appreciated. Have you checked it without the logic level shifter and verified that it is in fact not safe? I know many of the boards that use 4.7K pullups are safe on a 5V arduino. I can't tell from the back. But it looks like you have the option to pull the SCL/SDA up to 3.3V, but that it isn't the default? Is that correct? I'd have to do the math, but using the 10K board pullups to 3.3, and the arduino's internal pullups of (im not sure resistance) you could be pulling up to below the 3.63V max on the sensor and be safe without a logic level shifter. Can anyone give an idea as to the distance this sensor can work effectively? Can I get this product without the rgb sensor. The Board should have the ADC, I2C interface and the registers. I am willing to pay the smae amount for this setup. Please do respond urgently. Hi, unfortunately we can not sell products other than how they appear on the site. You can buy the board as is and remove the rgb sensor (although there is no ADC or registers on the board). You can also check out the Eagle files and order your own PCB from somewhere like OSH park and populate the resistors and capacitors yourself. If you have any other questions please post a new topic on the SparkFun forums. Could anybody explain the maximum and minimum values for each Red Green and Blue reading so I can map them across colour scales, is it O - 2^16 for each colour given that their 16 bit unsigned integer readings?